Oleh Babayev in September 2011. 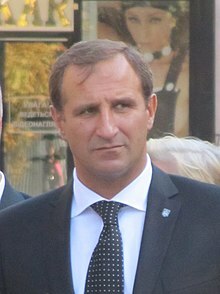 Oleh Meydanovych Babayev (Ukrainian: Олег Мейданович Бабаєв; 21 October 1965 – 26 July 2014) was a Ukrainian politician and businessman. He was the Mayor of Kremenchuk, Poltava Oblast from 2010 until his death. He was also the owner of two football teams in Poltava Oblast. Babayev was born in Kursk, Kursk Oblast which was then part of the Russian SFSR in the Soviet Union. He was of Azerbaijani ancestry. Babayev was shot dead on 26 July 2014 outside his home in Kremenchuk, aged 48. He had three shotgun wounds. ↑ "У Кременчуці застрелили мера - джерело" (in Ukrainian). Ukrayinska Pravda. 26 July 2014. Retrieved 26 July 2014. Wikimedia Commons has media related to Oleh Babaiev. This page was last changed on 9 August 2014, at 00:34.